Oriental Plovers Charadrius veredus are a species of shorebird that we see in varying numbers around Broome and they may be on the beach, feeding on insects across the plains or at the ephemeral lakes. During February there have been astonishingly high numbers some years and this has been as a result of insect activity. After good rains we get a variety of locusts and this will attract various insect-feeding birds from afar. Oriental Plovers stand very upright and look very brown compared to the usual grey of shorebirds and tend to be rather more vocal in flight. They breed in the arid inland areas in Mongolia and northern China and then migrate south into coastal parts of south-east Asia and northern Australia. 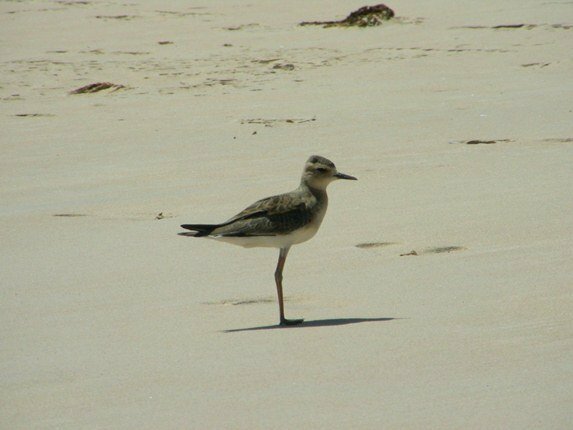 Here are some photos of a lone Oriental Plover on Cable Beach. The other extreme is where you have a very hot day and the birds move off the vegetation on the plains and seek shelter from the heat. They roost in literally thousands taking advantage of the sea breeze and then returning to the plains to feed in the evening. They will roost amongst the Oriental Pratincoles and the Little Curlew and all of these species will be higher up the beach than the other shorebirds that are present. Here is an example of a roost site along Eighty Mile Beach to the south of Broome in February. Oriental Pratincoles, Oriental plovers, Little Curlews and more! This truly is an incredible sight and it is all depends on what the weather brings us each year. Your Oriental Plovers act like our Black-bellied Plovers– standing on one leg and gazing into the distance. I love their huge eyes. It must be amazing to see so many flocked together, as that is something I’ve never seen with plovers before. Lovely photos, Clare! 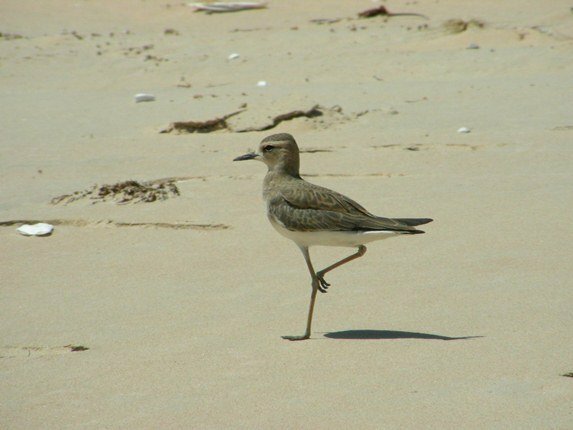 Shorebirds always seem so relaxed on one leg! 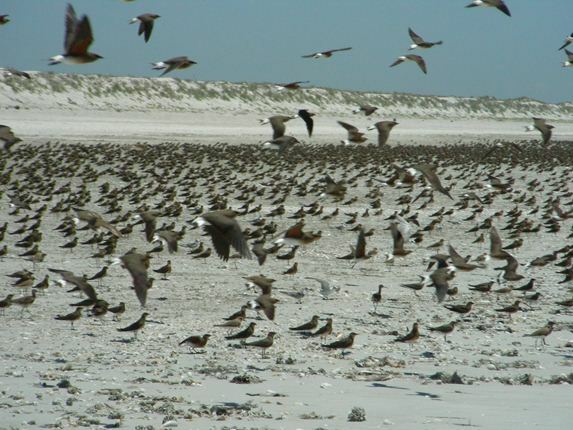 Huge flocks of shorebirds are one of the main attractions here in the north-west of Western Australia! Who knows how they cope with cat 4 cyclones like we have just had, but they do! 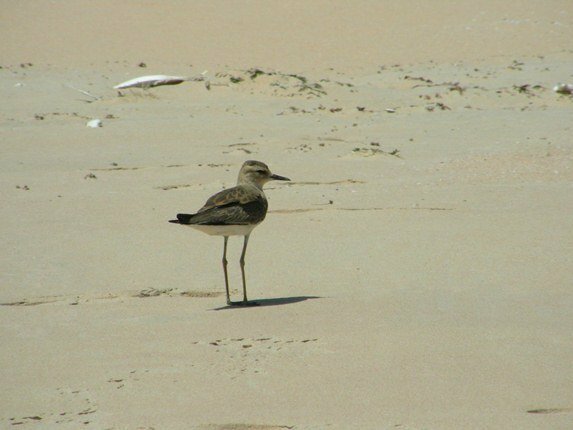 @ Larry-you will get a few of the shorebirds from Broome in your area. Have you ever seen any marked ones from Broome-they carry a yellow flag on their right upper leg? I was very happy and lucky to finally see Caspian Plovers last year, and Orientals look like their big brother. Nice, nice, nice.